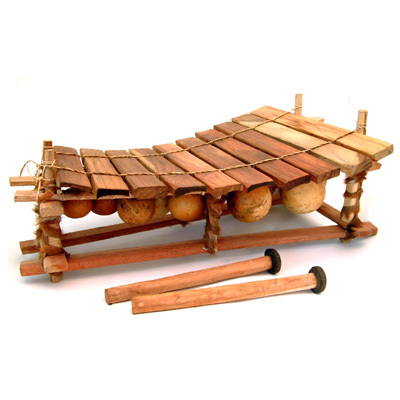 This traditional 12 note pentatonic xylophone from Ghana, with hardwood keys, gourd resonators and beaters made from old tyres. Also known as Balafon or Marimba, they are traditionally played on their own or with flute or drum, and are used at funerals, festivals and celebrations providing both melody and rhythm. Size: 80 x 46 cm.